Heather Flowers had a busy 2018. Early in the year she teamed up with Ryan Rose Aceae to release the brilliant Genderwrecked and then later on she released her episodic tour de force Extreme Meatpunks Forever. This to say nothing of the smaller projects she also found the time to make and release last year. We’ve talked about Heather’s work before on the blog, but we’ve never talked to the dev herself. That is, until now. Heather was kind enough to answer some of our questions about Extreme Meatpunks Forever now that the finale has been out for a few months. Read on for Heather’s thoughts on working episodically, technology made out of meat, and what’s next for the Meatpunk universe. 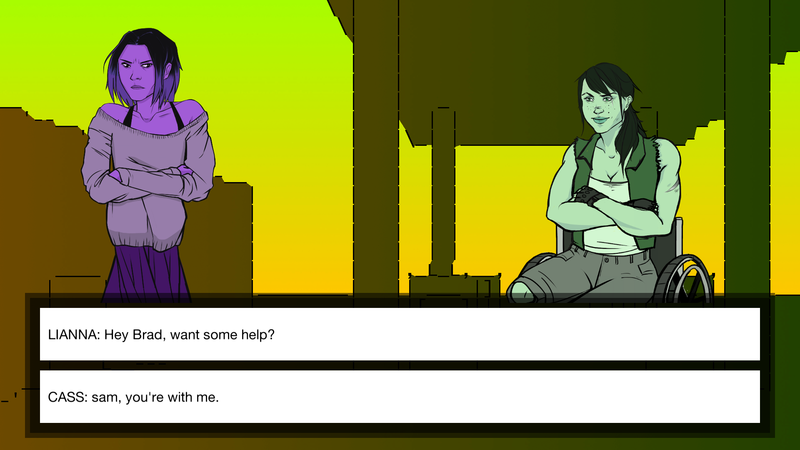 Let’s start with the basics: Who are you and what is Extreme Meatpunks Forever? My name is Heather Flowers. I'm an independent game developer from Oklahoma. One time an old man taught me how to fight wild dogs in an alleyway. Extreme Meatpunks Forever is a visual novel/mech brawler about gay disasters beating up neonazis in giant robots made of meat. It's set in this alternate universe version of the American Southwest called the Hellzone, where most technology is made out of meat. I've seen some people call the world of Meatpunks a dystopia, or post-apocalyptic, and I don't feel that's quite accurate. If that's how you wish to read it, then it's a valid reading, but the purpose of that world is to be just as bad as our world, but in much more obvious ways. You initially launched Extreme Meatpunks Forever with two episodes and have subsequently added four more. What’s it been like working in an episodic model? Episodic models are tricky to get right, especially as an independent developer. I'm glad I decided to go for it, as it provided a great amount of community engagement over the course of the game. Additionally, the episodic model provides a built-in structure: you immediately know roughly how much content you need to put in a given episode to make it work. Each standard episode takes roughly a month to make (the finale took two and a half months just because of all the new characters and mechanics it adds in), so it's definitely a lot of work, but I personally feel like it's a rewarding model for a game like this, where community engagement is extremely important. What made you want to tell this story episodically? It was, admittedly, at first an experiment. There are very few indie episodic games, and most of them put out an episode every few months rather than every couple weeks. Once I got going, though, I found it to be a great structure for telling a longer story. After making the decision to make the game episodic, I wrote up a document detailing the entire six-episode plot arc of Season 1 within a couple days, and was able to stick with that exact design document's manifest for the entire length of the game. Splitting the game into episodes allowed me to focus intently on one episode, then the next, etc. So one big projects became, in a sense, six much smaller ones, which is a distinction my brain likes very much. In addition to making the Meatpunks game, you wrote a Meatpunk Manifesto. How does your worldview inform the manifesto, and how did that translate into the game? My worldview is essentially this: the world is in a very bad place right now (what with global warming, imperialism, the ever-strangling vampiric hand of capitalism) and many days it's a struggle to even survive. It's very easy to feel hopeless, and that's an understandable feeling, but we can never stop fighting for what is right. It doesn't matter whether we "win" in the end, as that's out of our individual hands. What's important is that, no matter what, we never stop fighting to do good. The reason I made the Meatpunk Manifesto is because I'd become frustrated with genre movements such as cyberpunk in which defeatism plays a massive part: saying that the world is terrible because of these massive corporations, and that we can survive, but trying to fight is pointless because we're like bugs under their feet. They forget how terrifying a swarm of bugs can be if they're unified towards a singular goal. The manifesto was a mission statement for the game: what I was going to try out, the aesthetics I planned on incorporating, what I felt was ethical practice for game development. You’ve teased on Twitter that there is more Meatpunk action coming at some point. Do you have any idea what that’s going to look like? Absolutely! I can't spoil EVERYTHING down the line, but I will say this. EXTREME MEATPUNKS FOREVER: Season 2: Bound By Ash is currently in pre-production, with a planned Kickstarter launch early this summer. It follows our heroes from Season 1 as they travel through the bloody mountains of Rozarx, meeting old friends and new enemies on their quest to steal the sun. Additionally, I am working on a Meatpunks tabletop role-playing game, a Meatpunks comic (set in the ghost-ridden landscape of Tornado Valley), and a few other bits and pieces I think people down the line are going to enjoy. I really love this universe, and I want to spend as much time creating in it as possible, plumbing its depths. Finally, do you have a favorite character? Oof, a tough one to wrap it all up!! Out of all characters, I really like Emily, the eldritch horror teen gas station worker. She has a lot of personality in the short amount of time she's onscreen, and when her scene ended I *really* wanted to just keep her as part of the main cast, but I have other plans for her. Out of the main cast, I have to go with Sam. He's so normal and so weird at the same time! I love writing him. Extreme Meatpunks Forever is available now.